Baby, it’s cold outside! It is definitely January here in the northeast! I just want to stay inside and turn on the oven! Any little bit of extra heat helps! However, as much as I would love to be baking cookies and cakes and pies, I’m trying to stay with the “healthy” theme for the new year, and increase the vitamins and anti-oxidants in my diet, Less flour, sugar, and butter, and more fruits and vegetables! 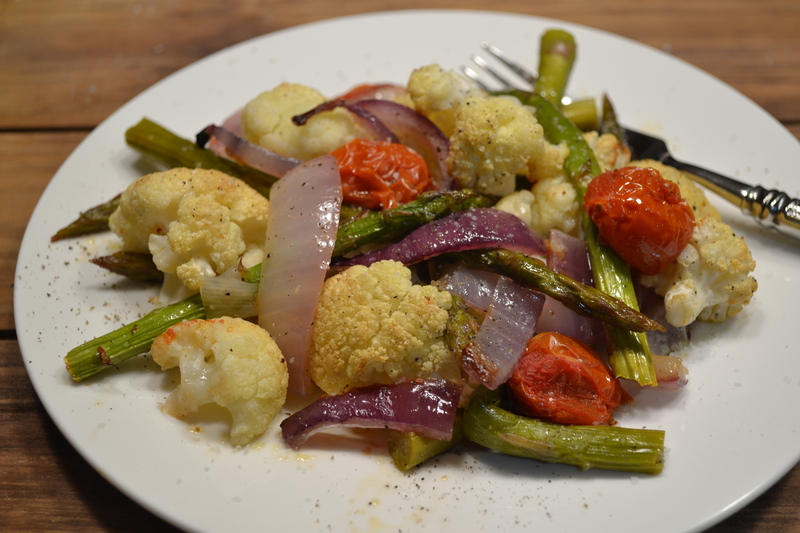 So, I decided to roast several different vegetables together. Since I can’t grill them, which is my favorite way, I chose to roast them. Roasting brings out the sweetness and flavor of the vegetable – they slowly carmelize and get slightly crispy, tasting much better than steaming or microwaving. 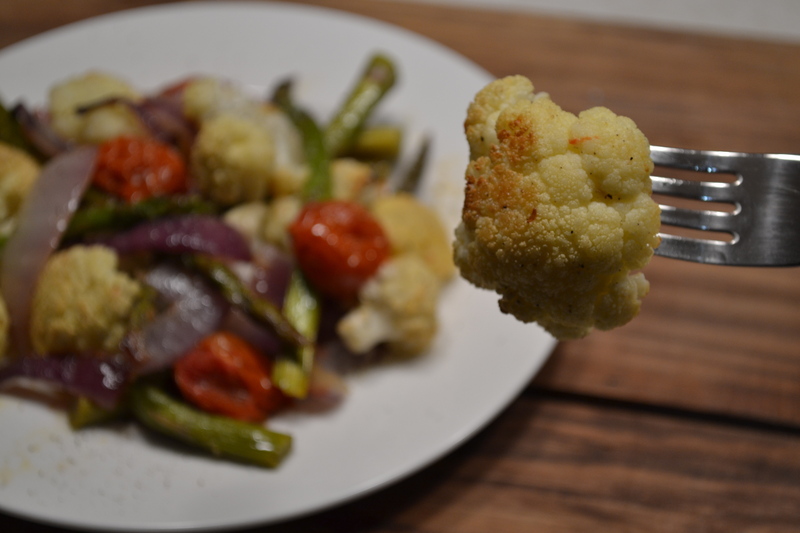 If you are not a big vegetable fan, you should try roasting them for a rich and sweeter flavor! 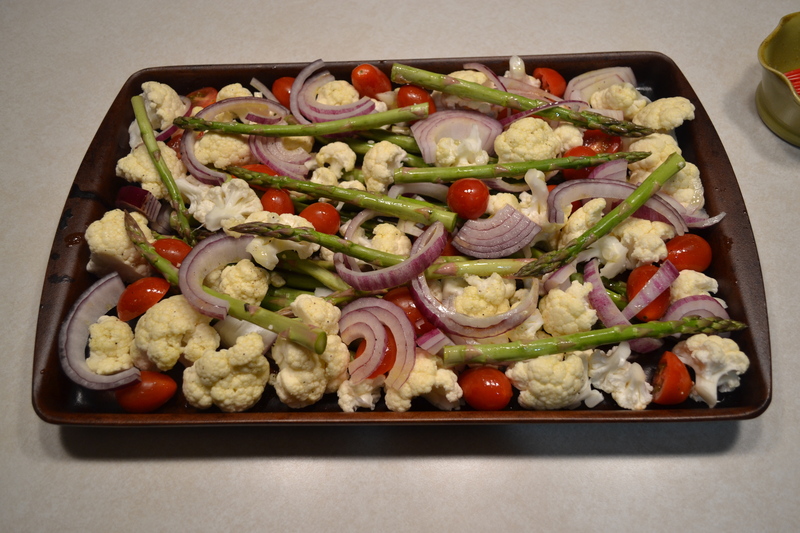 I used asparagus, grape tomatoes, red onions, and cauliflower for this batch. They are so colorful together! This recipe requires no measuring or mixing. It is super easy! 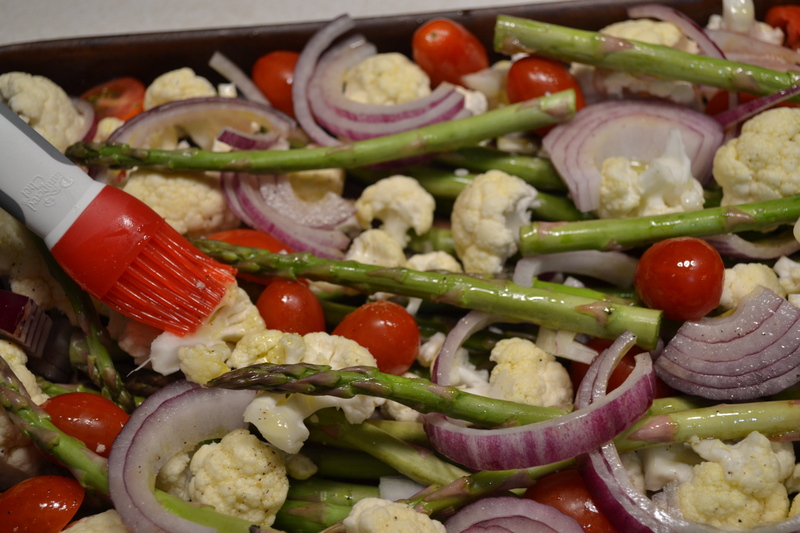 Just cut up some of your favorite vegetables, coat with oil and seasonings and put in the oven. Easy and nutritious! You can’t beat that! They are a perfect side for roasted chicken or a beef or pork roast. Another idea is to mix them with pasta, or toss on your salad. And if you have any leftovers, you can toss them into the food processor with chicken broth and have roasted vegetable soup! That’s what I did with my leftovers. One thing about the seasoning I would like to share – I have discovered “Himalayan Salt”. This was found at my favorite local olive oil and vinegar store http://www.oliveoiletc.com/. Not only should we be aware of the nutrients we are putting in our bodies, but also the words that we speak. I like that this verse says “seasoned with salt” – salt is a flavor enhancer, so we should “enhance” our conversations with grace and compassion. Kind words are received much easier than unkind words, which can create bitterness and hurtfulness. As we work on getting healthy with our food choices, we can start to get healthy spiritually with the conversations we are having with others, using our words to build each up and encourage one another. Cut up your favorite vegetables – ex: carrots, onions, broccoli, cauliflower, squash, tomatoes, potatoes, asparagus, peppers, eggplant, etc. Lightly coat with olive oil and place on a baking sheet or baking dish (my dish was stoneware so it was non-stick, but you could line your pan with foil for easy cleanup). Sprinkle with salt, pepper, and seasonings of your choice – parsley, basil, marjoram, or rosemary, for example. Roast for 25-30 minutes, halfway through, turn them over with a spatula and roast for an additional 25-30 minutes, or until tender. Welcome 2015! And welcome to a new year of healthy eating! After all the sweets and cookies are gone, it’s time to get back to eating healthier and lighter foods. The problem is I love sweets! I have a very hard time resisting them. I’m not making any promises that I will eliminate sweets completely :), but I am going to try to increase the amount of fruits and vegetables into my daily diet. The more fruits and vegetables you eat the more antioxidants you are putting in your body, which helps build your immune system. That is especially important during this cold and flu season. 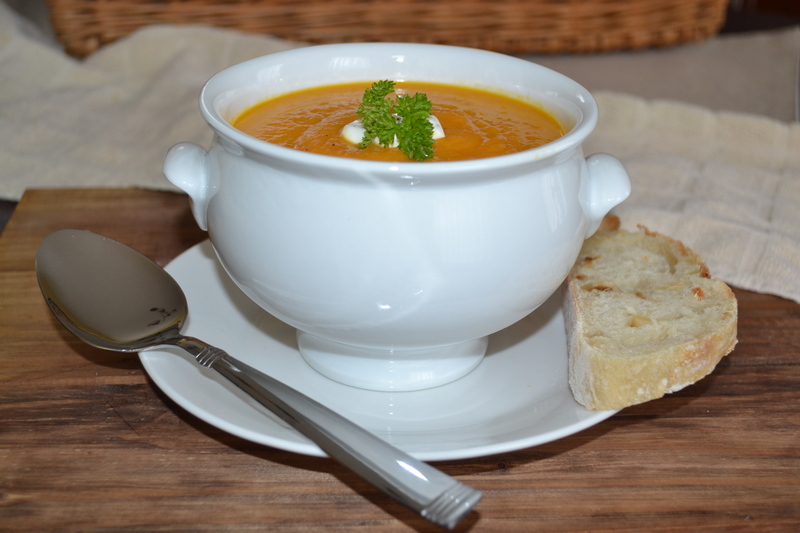 This recipe for Carrot Ginger soup is very high in anti-oxidants and contains lots of vitamins and minerals. 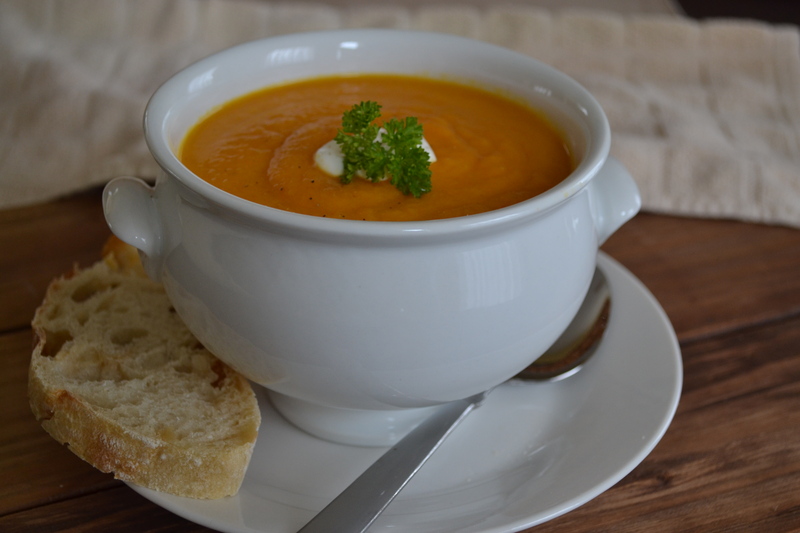 Most notably from the carrots, there is over 210% of your daily allowance of Vitamin A. 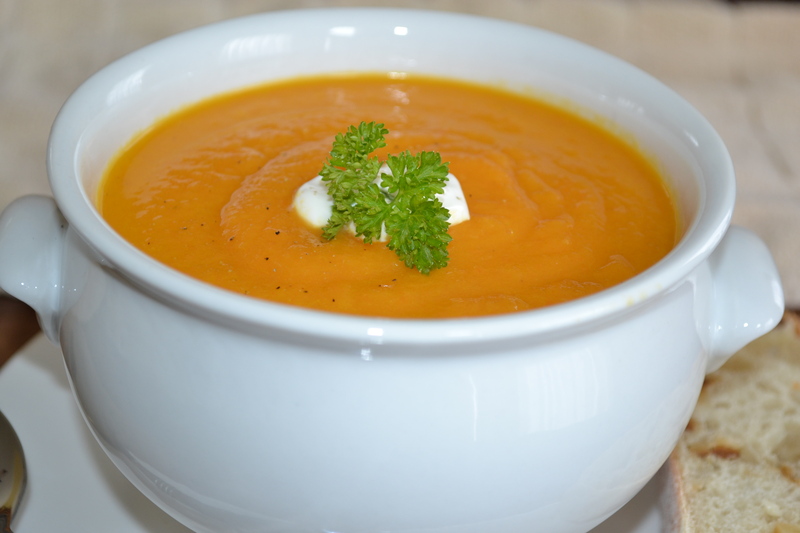 Carrots also contain Vitamin C, Vitamin K and Vitamin E. The anti-oxidant in carrots is beta-carotene. 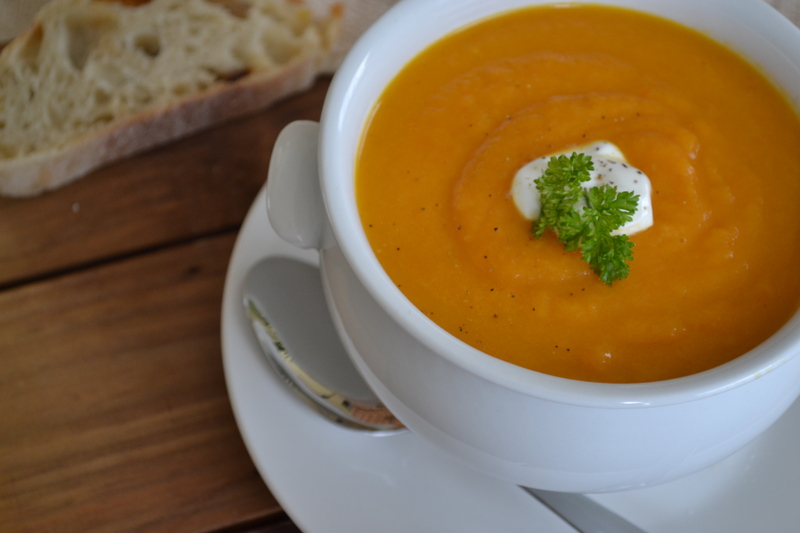 This gives the carrot its orange color and its anti-cancer and immune boosting benefits. Ginger has its own set of benefits, which is prevention of colds and flu, aides in digestion and stomach issues, helps absorption of essential nutrients by stimulating enzymes in the pancreas, aides in motion sickness, maintains blood circulation. It also reduces pain and inflammation, has anti-cancer effects for colon cancer, and strengthens your immune system. That is a whole lot of benefits in just 2 ingredients!!! Not only is it important for us to stay healthy physically, but spiritually as well! What does it mean to “get healthy” spiritually? I think it means to have more awareness of God in your life. Recognizing that everything happens for a reason, no matter how small or insignificant it is; seeing God all around you in nature, animals, people, and circumstances; realizing a need for God in our lives, on a daily basis; realizing we do not have ultimate control over our lives; learning to trust God and allow Him to be our guide; and believing that ALL things are possible with God! If we work towards these things, and give Him all the Glory, we will be blessed! Let’s start the new year getting healthy both physically, by what we eat, and spiritually, by how we are living our lives. Blessings for a fantastic 2015!! 4. Add carrots and chicken broth; cook on medium heat until soft – about 20-30 minutes. Add grated ginger. 5. 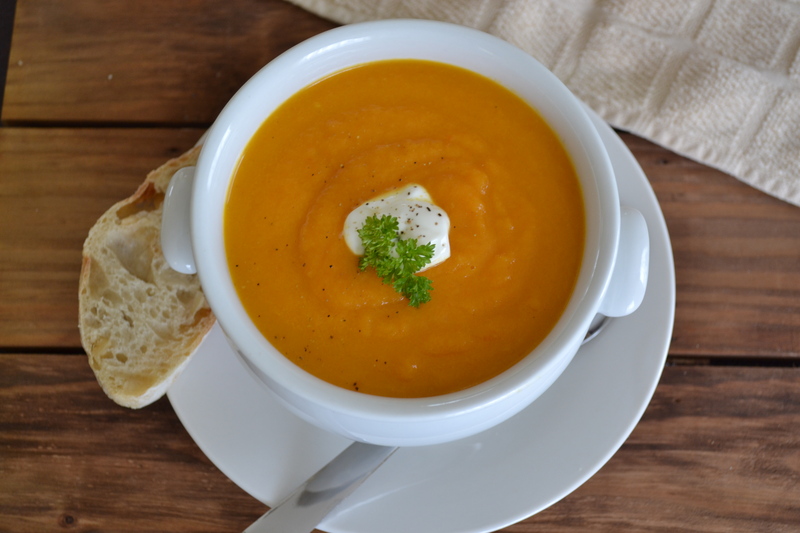 Use an immersion blender and blend in the pot, or transfer into a food processor and puree until smooth, adding a little extra chicken broth to get to your preferred consistency. If using a food processor, this may need to be done in a few batches. 6. Heat back to desired temperature. If desired, top with sour cream. Enjoy! 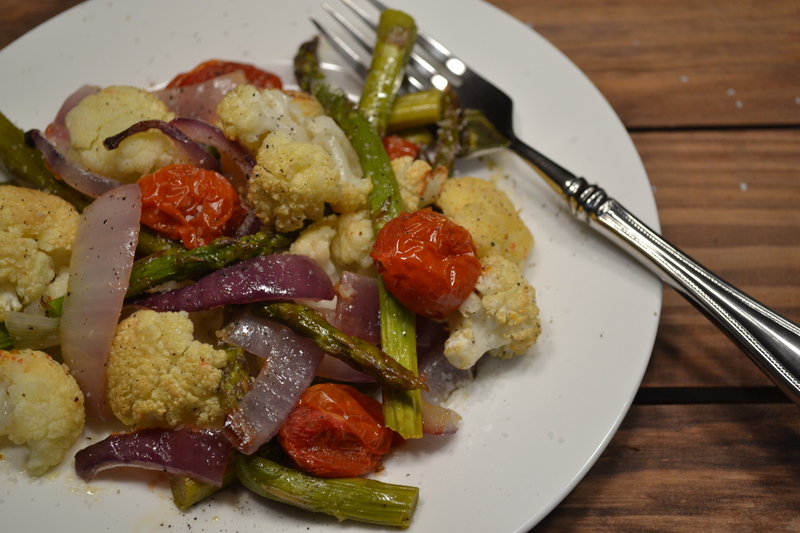 Eating healthy is important to me, so I will be focusing on more healthy recipes for 2015. I already have a few ideas for future posts, but I also welcome your ideas too! If you have a favorite “healthy” recipe you would like to share, please let me know!